Not to be confused with Bowser's Castle. The castle that walled off the sky. Bowser's Kingdom is the thirteenth kingdom visited in Super Mario Odyssey. It is the home of Bowser and the greater location of his castle. Unlike most games, which feature a Western European design for his castle, this castle is a lush, flowering traditional Japanese castle, with a concentric series of walls and baileys, a traditional garden and tea house, and a central keep. Instead of the usual lava, its moats are filled with poison. At the end of the kingdom, Mario and Cappy must defeat RoboBrood, a giant robot piloted by the Broodals. After defeating the Broodals, Mario and Cappy visit the Moon Kingdom to chase after Bowser and Princess Peach. Mallets big enough to climb on. Don't run afoul of the Stairface Ogres that guard this kingdom. When they spot an intruder, they bring their huge mallets down, no questions asked. On the other hand, you have to admire their tenacity and work ethic. The scars on their faces show they don't give up easily. Architecture as lovely as the scenery. This kingdom's architecture is unique. Roofs are made of heavy, layered tiles that will not budge even if walked upon. They also create a uniformity in the overall design, enhancing the beauty of the palace. Though you can move along the roofs, this palace rests quite high in the sky, and if you fall off, you will most definitely die. It's not the surest footing either, so be careful. Statues or not, they're certainly imposing. The palace tower highlights the inner citadel, and the gate leading to it is guarded by fearsome statues. 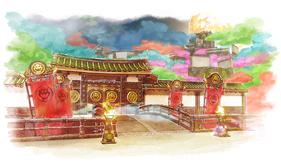 The statues are fashioned after gods of wind and thunder, the perfect motif for a sky palace, and since they are modeled on Bowser, the ruler of this kingdom, they serve as a warning to foes here and abroad. Surrounding the inner citadel are the second and third courts. The second court is especially fortified, with many cannons to repel invaders. Cannonballs often roll along the ground, and many tourists fall trying to evade them. Legends speak of invaders repelling the cannonballs with spears, but no mere mortal could hope to do this, so try not to get too close! These statues, called jizo, stand in a row. This elegant garden is a balm for the brutality of this kingdom and will help you forget all the hardships you faced to reach it. You can even buy souvenirs, so be sure you stop by! All along the walls, these holes were meant to allow defenders to shoot at invaders, but nowadays you're more likely to find a demon or a snake coming out than an arrow. Dart past the silent and lethal Stairface Ogres. Avoid being distracted by the ominous (yet brightly glowing) clouds. Survive the various traps designed to end your trip early. Bowser's Castle Treasure Vault Open doorway Below the left side of the large poison pool surrounding the "Beneath the Keep" Checkpoint Flag A small, golden room with many Coin Stacks and a treasure chest containing a Power Moon. The doorway leading to this room is reached by scaling the wall with spinning, wooden, circular panels as a Pokio. The coins do not reappear if Mario revisits the room after he has already collected them. The Folding Screen Locked door guarded by a New Donker Behind the Crazy Cap shop An 8-bit area set inside a folding screen in a small room. Mario can only access this area if he is wearing his samurai set. The Spinning Tower Closed doorway Below the left side of the large poison pool surrounding the "Beneath the Keep" Checkpoint Flag A tower-like area with segments that spin at intervals, where Mario must capture a Pokio and use it to scale the tower's walls to reach the Power Moon at the top. Below the tower is a key Mario can use to make a second Power Moon appear. Mario must defeat the nearby Stairface Ogre to open the gate leading to this area. Jizo Area Warp Pipe At the Showdown Arena after RoboBrood has been defeated An area where Mario must capture several Jizo statues and place them on several P Switches to activate bridges, walls and elevators, creating a path to a Power Moon. Many retracting spikes appear as hazards, which Mario is immune to as a Jizo statue. Sky Slope Area Beanstalk On the eaves just below the gate to the Spinning Tower A sky area where Mario must collect as many Rocket Flowers to traverse a long slope to the other side. Unlike the other sky areas, the camera is positioned behind Mario by default rather than from the side. The seed that grows the beanstalk leading to this area can be found on the same eaves. Hexagon Tower Moon Pipe On the isolated building northwest of the Main Courtyard A transparent hexagonal tower-like area featuring boulders that drop down like inside a pachinko machine, where Mario must capture a Parabones and use it to fly to the bottom of the tower to collect Moon Shards and a key required to obtain Power Moons, while avoiding the boulders on the way down and back. 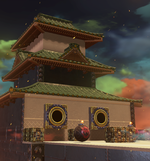 The Wooden Tower Moon Pipe On the isolated building southeast of the Main Courtyard A platforming area composed of a wooden, frame-like structure with rotating pillars where Mario must capture a Pokio and use it to scale said structure while avoiding Spinies and several other Pokios. Infiltrate Bowser's Castle! : The goal is to defeat the Stairface Ogre at the rear of the Third Courtyard. 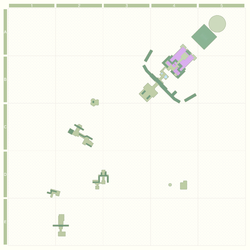 Smart Bombing: The goal is to collect the Moon Shards at the rear of the Second Courtyard. Big Broodal Battle: The goal is to defeat Topper and Hariet at the entrance to the Main Courtyard. Showdown at Bowser's Castle: The goal is to defeat RoboBrood at the keep of Bowser's Castle. There are two paintings in this kingdom. One is located at the left building near the Main Courtyard Entrance's Checkpoint Flag, at the left side of the wall. It takes the player either to the Snow Kingdom Clifftop at the Snow Kingdom or the Diving Platform at the Seaside Kingdom, and it can be accessed after completing the main game. The other painting is located at the Island in the Sky, which can only be reached from a painting in the Cascade Kingdom. Bowser's Kingdom has red Power Moons. There are a total of 64 Power Moons (61 regular Power Moons and 1 Multi Moon) in this kingdom. During the player's first visit to this kingdom, they can collect 37 Power Moons and the Multi Moon. After the player defeats Bowser in the Moon Kingdom, 7 more Power Moons become available to collect, including one from the kingdom's Hint Art and one from using a painting found in the Cascade Kingdom. The Moon Rock will also be available to destroy, causing 17 additional Power Moons to be accessible. In order to progress to the Moon Kingdom, the player must collect at least 8 Power Moons. There are a total of 100 regional coins that can be found in Bowser's Kingdom, which take the form of kobans with Bowser's insignia on them. 4 coins: On top of the roof past the entrance door. 4 coins: In plain sight at the end of a roof. 4 coins: On the highest roof on the left. 4 coins: Obtained by capturing a Pokio and using it to climb the wall to reach the coins. 3 coins: Near the checkpoint flag. 3 coins: On the top of the roof on the right side. 3 coins: Near a group of Spinies. 4 coins: Obtained by capturing a Pokio and going up and to the back side of the wall where the coins are. 4 coins: After hitting the hidden ? Blocks on the wall on the left side to go up the roof, the coins are found on the edge on the left. 3 coins: Found by capturing a Pokio and using it to climb up the highest roof. 3 coins: Obtained by capturing a Pokio and dropping down a certain point. 3 coins: On the roof of the Crazy Cap shop. 3 coins: On the roof on the right. 3 coins: Near the checkpoint flag on the roof, at the lowest point on the right side). 3 coins: Obtained by capturing a Pokio and climbing up the left side of the roof. 3 coins: Obtained by capturing a Pokio and climbing up the middle of the roof. 3 coins: Near the checkpoint flag, obtained by capturing a Pokio and dropping down. 4 coins: Obtained by capturing a Pokio and climbing the wall. 3 coins: Obtained by capturing a Pokio and climbing the wall. 3 coins: On a ledge below the checkpoint flag. 3 coins: On the left side of the moving walls. 3 coins: On the floor beneath the left side of the roof. Wall jumping is required to reach them. 3 coins: On the floor beneath the left side of the roof. 3 coins: On the floor beneath the right side of the roof. 3 coins: On the floor beneath the right side of the roof. They are reached by capturing a Pokio and using it to climb the wall. 3 coins: Under the bridge, obtained by capturing the Lakitu on the right side. 3 coins: Found on the other side via the Sparked Pylon. 3 coins: Found on the other side via the Sparked Pylon, under the roof to the left of the golden Bowser statue. 3 coins: At the northwest corner, reachable using Lakitu. 3 coins: In plain sight, up the flag. Many ornaments strewn throughout the kingdom, such as the nobori and the chōchin, contain the kanji 寿 (kotobuki), which means "long life". Some chōchin additionally contain the compound 空覇 (can also be read as kuppa, Bowser's Japanese name), literally meaning "celestial supremacy". Put together, the kanji translates as "Long live King Bowser!" The kingdom's industry (hanafuda cards) may be a reference to Nintendo's origins as a card company. 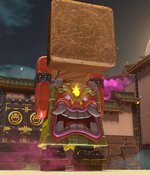 The Bowser statues seen during the boss battles against Topper and Hariet are based on the Japanese gods Fujin, the god of winds, and Raijin, the god of thunder, respectively. This page was last edited on April 6, 2019, at 10:51.